Hello Friends! 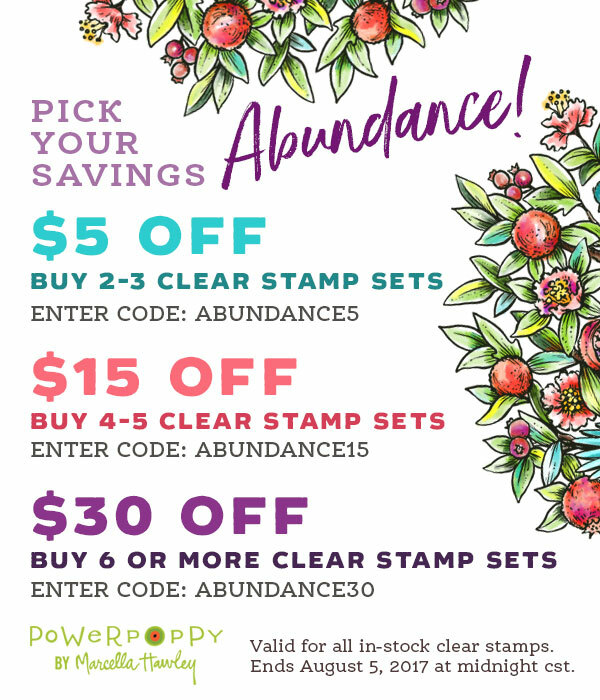 I’m so delighted you stopped by today, and I hope you’ve enjoyed the last week of sneak peeks for Power Poppy’s Abundance Collection! Today we’re showing off the final set, and I think we’ve saved the best for last! This set allows you to create precious little vignettes that can work on their own, or under a little glass dome, also called a Cloche. A Cloche has some fun vintage history because they were designed to keep plants warm in chilly temperatures, but now it’s a very popular design trend to display sweet things together. It is just like Marcy to create her own little collections of things that work beautifully together, and she does it so skillfully again in this set, called Under Glass. There are so many lovely collections in this set that it was hard to pick which one I wanted to work with first. I finally settled on this adorable little nest scene, with the book and greenery. It’s coloured up with Copics. Then, I trimmed the cloche out and placed it on a little sponged scalloped circle. I chose to do a tall and skinny card design for this one, it seemed to fit the petite-ness of the little pretties in the cloche. The card is 3 3/4 x 5 1/2. Isn’t that the sweetest little scene? I added a bit of speckle for those little eggs in the nest. A little strip of plaid paper, a bright orangey-yellow ribbon and some enamel dots add a bit of the colour. This set has some really sweet sentiments in it, but I chose to use a sentiment from our first set we showed you this week, Vibrant Thanks, because of that lovely little scripty Hi. Sorry about the haphazard collection here of the Copics I used, but this was another one that I coloured when I was visiting my mom and dad, so I grabbed them all quickly and snapped a shot with my phone. 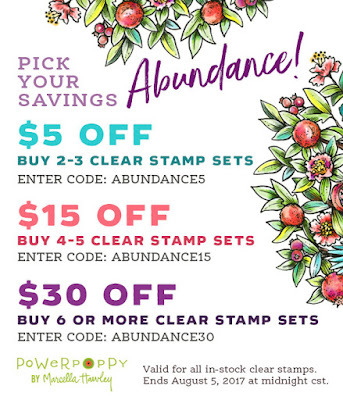 Now all of these amazing sets in the Abundance Release are AVAILABLE! And did you hear about Marcy’s new promotion? It’s a fabulous one! Cute cloche scene. Cool set. This is such a darling, unique idea for a stamp set! That Marcy! Hopped right into my shopping cart along with the rest of the sets, and all because you girls did such an amazing job on the release. Beautiful, sweet card, Christine! So sweet, Christine! 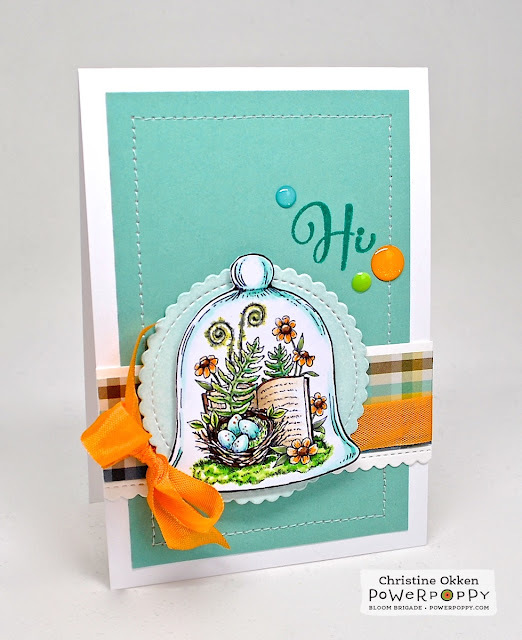 I love the petite scene, speckled eggs, paired with vibrant color that you do so well! You're always so kind to show the copics, too...thank you! Love this release! Christine, this is absolutely darling, and I LOVE these sweet cloche scenes! 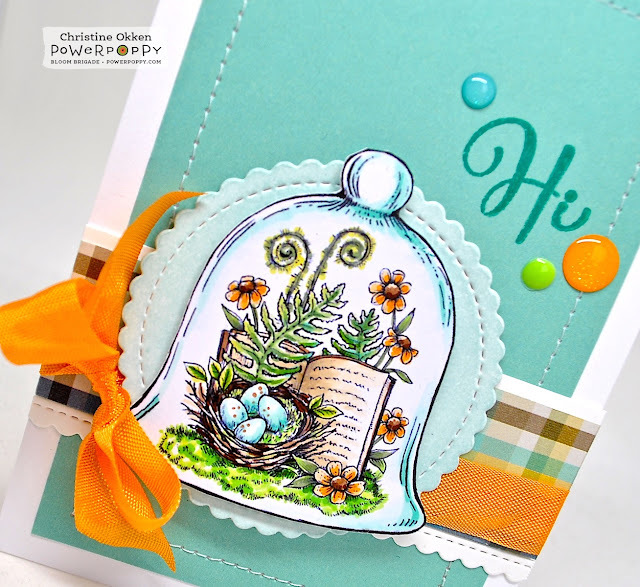 So sweet, and what a beautiful card with a great palette! I LOVE it! Hugs!